AIIMS Bhubaneswar is one of the six AIIMS like apex healthcare institutes being established by the MOHFW. 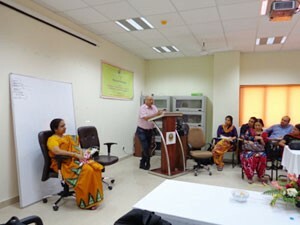 The Department of Community Medicine organized a Research Methodology Workshop on the 18th and 19th of March, 2013. Initially planned for faculty of AIIMS, the workshop eventually had PGs, Residents and Faculty from five other colleges in Bhubaneswar and proximal areas (Cuttack, Behrampur and Burla), as well. There were 40 participants in all. I travelled to Bhubaneswar on the 18th evening and went to AIIMS on 19th morning. Dr Sonu Subba – Addl Prof Community Medicine was the person who organized for my presence at this event. She first introduced me to the Dean, Dr Vikas Bhatia, with whom I spent about 7-10 very fruitful minutes. He asked me some questions about QMed and our workshops, and immediately talked about planning for them as soon as possible. The events of Day 2 had already been in progress and we went to the workshop room immediately after the morning tea break, for my session. Dr Sonu Subba first introduced me saying “I had met Mrs Vasumathi at Kasturba Medical College, Mangalore in a colleague’s cabin and she was introduced to me as an expert in literature search. At that time I remembered wondering what makes one an ‘expert in searching’… we are all doing it all the time. Later, when I attended her session at a FAIMER workshop, I realized that what I took 10 hours to search for, she could do it in half an hour. And I wanted all of you to learn from her too”! The forty people participated fully – ranging from a minimum of displaying complete concentration, to the best – asking questions! It is always a pleasure having an audience like this. I also realized at this workshop, that when I attend Research methodology workshops at different institutions and get to listen to different speakers, I get several new insights into topics like – Types of Studies, Sample size etc. It was wonderful hearing Dr Sonu Subba, and her two colleagues from the Community Medicine Dept – Dr Binod Patro and Dr Pritam Mahajan who delivered very interesting lectures. Dr Subba has a knack of actually taking the audience along with her! Dr Baijayanti Mishra from the Microbiology Dept talked on Scientific Writing, and her presentation had a clear set of points in each and every slide, and I think there is nothing she left out; yet her contents were crisp. At a small valedictory function, participants from each college, were asked to share some oral feedback / give suggestions. A very interesting feedback came from a senior faculty member who said “Though we are familiar with lots of what we heard, it still seems to go over our heads”! While there was laughter at this, I believe it really speaks of what most people feel till they actually do research projects and write about them. Dr Bhatia, in his concluding remarks did something I deeply appreciated. He named the doctor who gave the feedback about the workshop being very intense and said “I am hoping that he will be the first to do a project and write a paper” And then he added “I would want every participant here to make a promise to write a research paper”! It is wonderful to see a Dean who offered encouragement not only to his own faculty, but to all others. He also promised to organize more events. At the end of the workshop, Dr Bhatia gave certificates to the participants, and I was pleasantly surprised when I too was asked to hand out certificates to about half the participants. Small gestures make one feel part of the entire proceedings! Oh wow! That was some enthusiasm! I now hope to go over once more – this time with colleagues from QMed, to do full workshops! This entry was posted in 6 - Old posts and tagged AIIMS Bhubaneswar, Cochrane Library, Information Literacy, Mendeley, PubMed, Reference Management. Bookmark the permalink. ← An International Award – thanks to the support & good wishes from ALL of you!